This is not the first time when the Nilekanis are donating. In past, Nandan Nilekani gave money to rebuild the hostel campus of IIT Bombay. He also set up the Indian Institute for Human Settlements with the aim of solving urban challenges for India. Infosys co-founder Nandan Nilekani and wife Rohini will donate 50 per cent of their wealth under Giving Pledge- a movement initiated by Microsoft founder Bill Gates and Melinda Gates. Reports suggest that the Nileknis' wealth is estimated to be to the tune of around USD 1.7 billion. With this, the Nilekanis have joined the list of other Indian billionaires like Wipro Chairman Azim Premji, Biocon Chairman Kiran Mazumdar Shaw, and Sobha Ltd Chairman PNC Menon who have also committed half of their wealth to philanthropy. In a statement, the Nilekanis explained why they joined the Giving Pledge movement. They said: "We see that inequality is increasing sharply in most countries. We see the young and the restless in this interconnected globe, unsure of their future, wanting more but anticipating less. We see a growing politics of polarization, of divisions, of brinksmanship. It is as if the world holds its breath. What should we do at this time? That is a question every citizen must ask. Those of us who have wealth beyond all our wants must ask that very sharply. Wealth comes with huge responsibility and is best deployed for the larger public interest. So what must the super-wealthy do?" "We thank Bill and Melinda for creating this unique opportunity for so many people to realise a moral aspiration inspired by the Bhagwad Gita- Karmanye Va dhikaraste Ma Phaleshu Kadachana, Ma karma phalaheturbhurma Te Sangostvakarmani," the Nilekanis added. 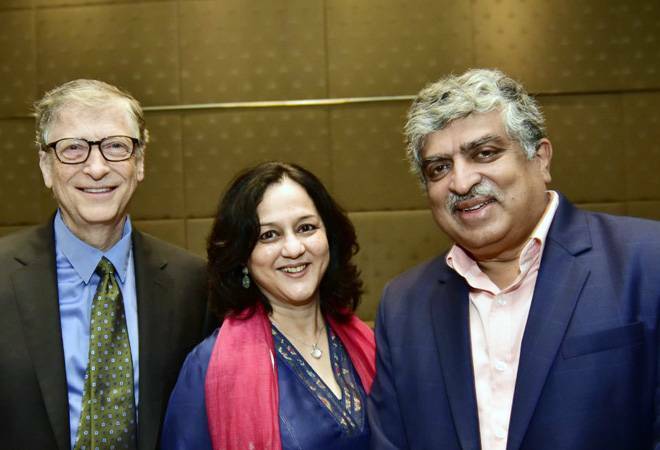 Bill Gates welcomed Nilekanis for their pledge and said: "I'm amazed by how Nandan Nilekani has lent his entrepreneurial passion to philanthropy. I'm delighted to welcome him and his wife Rohini to the Giving Pledge." The Giving Pledge is an effort to help address society's most pressing problems by inviting the world's wealthiest individuals and families to commit more than half of their wealth to philanthropy or charitable causes either during their lifetime or in their will. It is an open invitation for billionaires, or those who would be if not for their giving, to publicly dedicate the majority of their wealth to philanthropy. Under the pledge, signatories will find their own unique ways to give that inspire them personally and benefit society. The movement was started with 40 pledgers in the United States in 2010. As of November 2017, there are 171 pledgers from 21 countries.